March 29 (Bloomberg) -- Halliburton Co. and Schlumberger Ltd., trying to forestall a regulatory crackdown that would cut natural-gas drilling, are developing ways to eliminate the need for chemicals that may taint water supplies near wells. U.S. House and Senate bills introduced in 2009 would force producers to get federal permits for each well. That and other proposed environmental measures would cut drilling by as much as half and add compliance costs of as much as $75 billion over 25 years, according to a study done for the U.S. Energy Department. Biocides are employed because the watery fluids used to fracture rocks heat up when they’re pumped into the ground at high speed, causing bacteria and mold to multiply, Mueller said. The bacteria grow, inhibiting the flow of gas. Halliburton and Schlumberger, the world’s largest oilfield contractors, are among companies seeking biocide substitutes. Houston-based Halliburton said March 9 that it’s testing a process using ultraviolet light to kill bacteria in fracking fluid. About 80 percent of gas wells drilled in North America are stimulated or fractured in some way, Tim Probert, corporate- development chief at Halliburton, said in a telephone interview. “It’s incumbent on the industry to continue to develop tools and technologies that are compatible with minimizing the environmental impact of the stimulation process,” Probert said. Houston-based ConocoPhillips, the third-largest oil company, said March 9 that the world has centuries of gas supplies, largely in unconventional deposits such as shale. Houston-based Southwestern has tested an ultrasonic technique that moves water faster than the speed of sound through a cone-shaped vortex to kill bacteria before the fluid is sent down the well, Mueller said. Chemicals, including biocides such as chlorine, make up less than 1 percent of fracking fluids. The rest is water and sand. Companies haven’t identified the chemicals they use, citing competitive reasons. Advocacy organizations such as the Environmental Working Group in Washington have called for lawmakers to require energy companies to disclose the chemicals. Gas producers are realizing they have to find ways to clean and recycle the water used in hydraulic fracturing, said George P. Mitchell, the Houston billionaire who pioneered development of shale gas in the Barnett formation of North Texas. Environmental issues generally begin to be addressed after companies realize there will be a financial cost if they don’t act, said Geoff Kieburtz, an analyst at Weeden & Co. in Greenwich, Connecticut. 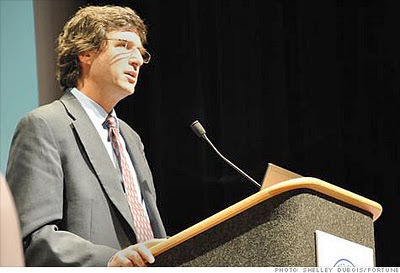 “The oil industry is as good as any at recognizing those things change over time,” he said. House and Senate bills introduced in June would force producers to wait for the U.S. Environmental Protection Agency to develop a permitting process. They’d then have to get approval from the agency for each well. The EPA said March 18 it will spend $1.9 million to study risks associated with fracking. Environmental concerns over gas production go beyond biocides. Two of 94 monitoring sites at the Barnett Shale, the most productive U.S. shale formation, had elevated levels of the carcinogen benzene in the air, the Texas Commission on Environmental Quality said in January. “Now, when they have the possibility that something might stop the fracturing and stop the development of the shale, that’s what you have to worry about,” said Mitchell. --With assistance from Edward Klump in Houston. Editors: Tony Cox, Susan Warren. 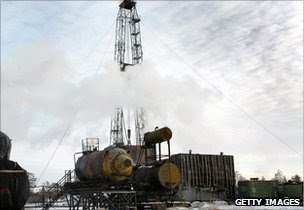 Q&A: will shale revolutionise gas? Will hopes of abundant shale gas supplies prove nothing more than a pipe dream? "If shale gas fails to deliver on current expectations, then in 10 years or so, gas supplies could face serious constraints." So says Paul Stevens, a senior fellow at the international affairs think tank, Chatham House. He's penned a report that raises serious doubts about whether shale gas will indeed deliver. So what is shale gas, why is it such a big deal, and what will happen if it turns out to be one big wild goose chase? Shale is a type of rock, typically found in a layer above conventional oil and gas deposits. The rock contains natural gas that can be extracted. US energy companies have become very successful in recent years at extracting gas from the shale alongside their existing conventional gas wells. US shale gas production has increased from almost nothing in 2000 to a 20% share of gas production in 2009, with some analysts projecting a 50% share by 2035. Shale reserves are also abundant in other parts of the world. Is that why the gas price has fallen so much? Gas prices have fallen sharply since 2008, but a lot of this is because of the recession. And prices vary greatly from one region to another. It is noticeable that in the US and Canada - where shale is having the biggest immediate impact - prices fell by more than half in 2008-09, much more sharply than in Europe. 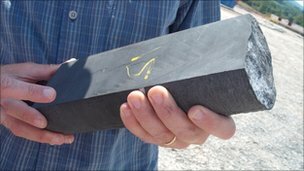 Why has shale been such a big hit in the US? the technological innovation of "horizontal drilling"
So why can't it happen elsewhere? Drilling for shale gas is geologically complicated, and the geology varies greatly from one shale deposit to another. This means the success so far in the US may not be easy to replicate with other untapped deposits - even other deposits within the US. It is also expensive. Shale gas deposits are thinly spread and wells dry out very quickly, meaning a lot of wells are needed to capture the gas. And shale drilling is inefficient, typically capturing only 8-30% of a deposit, compared with 60-80% for conventional gas drilling. Gazprom estimates the cost of extracting shale gas in Siberia at about five times the cost of conventional gas, though the Russian company may be exaggerating the cost as shale gas represents a threat to its business. What about here in Europe? The UK already uses a lot of North Sea gas, and a switch to European shale gas would be a boon. What happens if shale lives up to its billing? Then it means cheap gas for everybody - or at least for everybody who has access to it. The gas industry is still very regionalised, due to high transportation costs, although "liquefied natural gas" (LNG) technology is making it possible to ship gas around the world, just like crude oil. However, a shale gas boom could lead to serious environmental problems. What are the environmental problems? The "horizontal" drilling technique used to extract shale involves pumping chemicals into the ground. Those chemicals could push salt water to the surface, and they could also poison drinking water. Already in the US there is a backlash against shale drilling, with Pennsylvania placing a moratorium on one major new project, while the US Congress is considering stricter legislation. Shale may also present a problem for global warming, because it is an abundant fossil fuel that could be a cheaper substitute than many renewable energy sources. However, carbon (and noxious gas) emissions from natural gas are much lower than from oil and coal. So what happens if shale falls flat? This is the big concern in the Chatham House report. They think that the low gas prices and the uncertainty caused by shale are weighing down investment in the gas industry. Gas companies may be afraid to invest in new conventional gas wells or LNG facilities if they think future shale supplies could render them redundant. Given the long lead-times on gas projects, investment decisions now will affect gas supplies in 10 years' time. 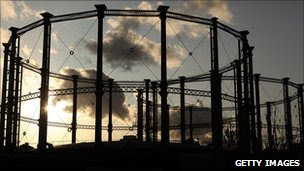 This means a shortfall of investment now could lead to a shortfall of gas - and higher gas prices - by 2020. The Chatham House report also thinks the uncertainty about shale is undermining investment in renewable energy sources. Injection into underground formations represents the most common approach for onshore management of produced water. 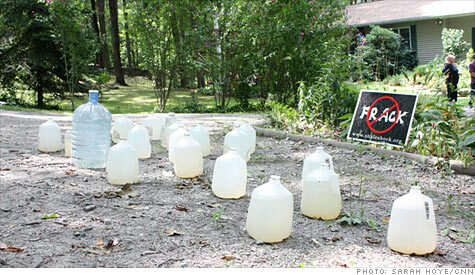 Under U.S. Environmental Protection Agency (EPA) rules, produced water injection wells are classified as Class II wells. Class II wells are further subdivided into II-R (enhanced recovery), II-D (disposal), or II-H (hydrocarbon storage). Most produced water is injected to maintain reservoir pressure and hydraulically drive oil toward a producing well. This type of injection for "enhanced recovery" is discussed in a separate fact sheet. This fact sheet describes underground injection of produced water solely for disposal. 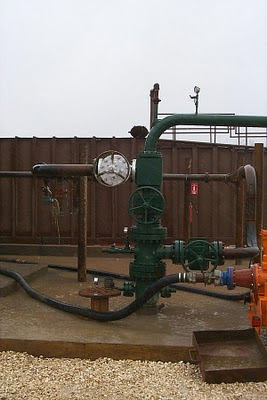 The figure )below) shows a typical injection wellhead. Injection well at Texas waste disposal facility; Source: J. Veil, Argonne National Laboratory. Significant volumes of produced water are injected in the United States. Virtually all states with oil and gas production operations also have produced water injection wells. According to the Ground Water Protection Council, approximately 170,000 Class II wells are found in 31 states (GWPC undated). In early 2003, Argonne interviewed staff from oil and gas agencies in three large oil- and gas-producing states (California, New Mexico, and Texas) to learn the number of injection wells in each state, and what percentage were used for enhanced oil recovery or for disposal. The numbers of wells and water volumes injected are estimates. Nevertheless, they highlight the importance of injection as a produced water management option. California had nearly 25,000 produced water injection wells. The annual injected volume is approximately 1.8 billion bbl, with about 20% injected for disposal. New Mexico had 903 permitted disposal wells, with 264 of them active. Approximately 190 million bbl of produced water is injected for disposal. Texas had 11,988 permitted disposal wells, with 7,405 of them active. In 2000, approximately 1.2 billion bbl of produced water were injected into nonproducing formations, and 1 billion bbl were injected into producing formations. In sum, operators in these three states inject more than 4 billion bbl of produced water per year for disposal. Operators injecting for disposal will typically seek formations that exhibit the right combination of permeability, porosity, injectivity, and other geologic features enabling the injected water to enter the formation under pressures lower than fracture pressure. The injection formation should be geologically isolated from any underground source of drinking water (USDW) and from hydrocarbon-producing formations (unless the injection is for enhanced recovery). Operators should avoid areas with excessive faulting, fractures that extend vertically, or other improperly cemented well bores. Cross-section drawing of an injection well; Source: U.S. Environmental Protection Agency. Class II injection wells are constructed so that injected fluids are conveyed to the authorized injection zone and do not migrate into USDWs. Class II wells are drilled and constructed with steel pipe (called casing) cemented in place to prevent the migration of fluids into USDWs. Surface casing is cemented from below the lowermost USDW up to the surface to prevent fluid movement. Cement is also placed behind the injection casing at critical sections to confine injected fluids to the authorized injection zone. A typical produced water injection well is also equipped with injection tubing, through which the fluids are pumped from the surface down into the receiving geologic formations (GWPC undated). The figure below shows a cross-section drawing of an injection well with casing, cement, and tubing. It is important to ensure that the produced water injectate is compatible with the receiving formations to prevent premature plugging of the formation or damage to equipment. It may therefore be necessary to treat the water prior to injection to control excessive solids, dissolved oil, corrosion, chemical reactions, or growth of microbes. Solids are usually treated by gravity settling or filtration. Residual amounts of oil in the produced water not only represent lost profit for producers, but can also contribute to plugging of receiving formations. Various treatment chemicals are available to break emulsions or make dissolved oil more amenable to oil removal treatment. Corrosion can be exacerbated by various dissolved gases - primarily oxygen, carbon dioxide, and hydrogen sulfide. Oxygen scavengers and other treatment chemicals are available to minimize levels of undesirable dissolved gases. The water chemistry of a produced water sample does not necessarily match the receiving formation. For example, various substances dissolved in produced water could react with the rock or other fluids in the receiving formation, and trigger undesirable consequences. Before beginning a water flood operation, it is important to analyze the constituents of the produced water with the purpose of avoiding chemical reactions that form precipitates. If necessary, treatment chemicals can minimize undesirable reactions. Bacteria, algae, and fungi can be present in produced water. They can also be introduced in the course of water handling at the surface. 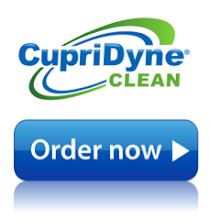 Bacteria, algae, and fungi are generally controlled through filtration or the addition of biocides. GWPC, undated, "Injection Wells, An Introduction to Their Use, Operation, and Regulation," prepared by the Ground Water Protection Council, Oklahoma City, OK. Available at http://www.gwpc.org/e-library/documents/general/Injection%20Wells-%20An%20Introduction%20to%20Their%20Use,%20Operation%20and%20Regulation.pdf [PDF]. Veil, J.A., M.G. Puder, D. Elcock, and R.J. Redweik, Jr., 2004, "A White Paper Describing Produced Water from Production of Crude Oil, Natural Gas, and Coal Bed Methane," prepared by Argonne National Laboratory for the U.S. Department of Energy, National Energy Technology Laboratory, January. Available at http://www.evs.anl.gov/pub/dsp_detail.cfm?PubID=1715. Produced water is not a single commodity. The physical and chemical properties of produced water vary considerably depending on the geographic location of the field, the geological host formation, and the type of hydrocarbon product being produced. Produced water properties and volume can even vary throughout the lifetime of a reservoir. How Much Produced Water Is Generated? Produced water is by far the largest volume byproduct or waste stream associated with oil and gas exploration and production. More than 50 billion bbl of produced water are generated each year at thousands of wells in other countries. At some point the cost of managing the produced water exceeds the profit from selling the oil. When this point is reached, the well is shut in. In contrast, a coal bed methane well initially produces a large volume of water, which declines over time. The methane production starts low, builds to a peak, and then decreases. This information and much of the background material used throughout the PWMIS site is based on Argonne’s produced water white paper [external site]. Veil, J.A., M.G. Puder, D. Elcock, and R.J. Redweik, Jr., 2004, “A White Paper Describing Produced Water from Production of Crude Oil, Natural Gas, and Coal Bed Methane,” prepared by Argonne National Laboratory for the U.S. Department of Energy, National Energy Technology Laboratory, January. While protecting our environment and enhancing our energy independence. NETL has expertise in coal, natural gas, and oil technologies, contract and project management, analysis of energy systems, and international energy issues. DIMOCK, Pa. — A private consulting firm says it found toxic chemicals in the drinking water of a Pennsylvania community already dealing with methane contamination from natural gas drilling. Environmental engineer Daniel Farnham said Thursday that his tests, which were verified by three laboratories, found industrial solvents such as toluene and ethylbenzene in "virtually every sample" taken from water wells in Dimock Township, Susquehanna County. Farnham, who has tested water for both gas interests and for local residents, said it would be impossible to say that the chemicals he found were caused by gas drilling. The chemicals, at least one of which, ethylbenzene, may cause cancer, are among dozens used to hydraulically fracture shale deposits to unlock natural gas trapped thousands of feet underground. The chemicals are also used in an array of products ranging from paint thinner to gasoline. The contaminated Dimock wells are in the gas-rich Marcellus Shale, where a rush to tap the vast stores has set off intense debate over the environmental and public health impact of the drilling process. Millions of gallons of water mixed with numerous chemicals and sand are blasted deep into the earth to free gas from the shale rock. As much as 90 percent of the mixture is left underground. Dimock residents sued Houston-based Cabot Oil&Gas Corp. last year, alleging the drilling company polluted their wells with methane gas and other contaminants. Pennsylvania's Department of Environmental Protection said defective casings on at least three of Cabot's wells allowed gas to pollute groundwater. Cabot was fined more than $240,000 and ordered to clean up the pollution. On Thursday, DEP said it would spend about $10.5 million to provide safe water for the affected Dimock residents, connecting their homes to a municipal water supply in Montrose, about six miles away. The residents balked at an earlier fix that would have placed large, whole-house water treatment systems in each of the 14 affected homes. DEP chief John Hanger told The Associated Press that the connection to public water is "the best, and really only, solution" and that if Cabot balks at paying the tab, the state will pay for the work itself — then go after Cabot for the money. Officials and residents had discussed another option — drilling a well or wells and piping that water to the homes — but Hanger said it was dropped because "we don't believe that will ensure a permanent, safe supply of water." A person who took part in the discussions said Hanger told residents the entire aquifer might be polluted by gas drilling operations. "He said, 'I cannot guarantee that there is any water in the aquifer that is clean today, that will be clean next week, that will be clean six months after the whole system is put in, because of the drilling activity and the damage to the aquifer.' It was repeated twice," said the person, who spoke on condition of anonymity to discuss a private meeting. Later Tuesday, Hanger denied through a spokeswoman making the statement. DEP spokeswoman Helen Humphries said Hanger believes the threat of stray gas migration is the chief problem with drilling new water wells. "We want to ensure there's not a chance for methane gas to migrate into the water wells. The best way of doing that is to install a water line to provide public water," she said. On Tuesday, 13 families in Lenox Township, about eight miles from Dimock, sued another Houston driller, Southwestern Energy Co., claiming their wells were contaminated with fracking fluids. Southwestern denied any problems with its well. In Dimock, Farnham said the water samples were tested independently by three labs, all of which showed the same results. But Farnham said it's impossible to tell where the chemicals came from. "Can anybody say that this came from fracking, or from frack flowback? There's no way a true scientist would be able to make that determination based on the data that we have," he told The Associated Press on Thursday. "Until and unless we are able to put a die or marker in the frack liquid, it's going to be awfully difficult to prove irrefutably that it's coming from frack." Cabot spokesman George Stark said the chemicals existed in some wells before drilling began. "We have asked for samples of the affected well water so we can do an independent analysis," he said. Dimock residents have claimed their wells were contaminated shortly after Cabot started drilling near their homes, saying the water that came out of their faucets suddenly became cloudy, foamy and discolored, and smelled and tasted foul. One resident's well exploded on New Year's Day 2009, prompting a state investigation that found Cabot had allowed combustible gas to escape into the region's groundwater supplies. Cabot says the methane in the residents' wells might be naturally occurring. Farnham — hired by Cabot in 2008 to perform pre-drill testing of residential water wells in Dimock — said those tests did not turn up any problems, adding he did not even test for the chemicals that Cabot claims existed prior to drilling. After the drilling began, Farnham was asked by residents to test their water, and was later hired by plaintiffs' attorneys. "It doesn't take me or any scientist to see some of the impacts on the drinking water," he said. "Your drinking water goes from clear and fine, to a week later being yellow-colored, sediment on the bottom, foam on the top and an oily smell to it. It's not a figment of anybody's imagination." The Dimock test results were first reported by The Times-Tribune of Scranton. 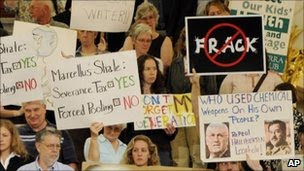 EPA on fracking: "we can only do so much"
FORTUNE -- In Binghamton, New York on Wednesday, hundreds of locals filled the Broome County Theater to speak their minds, two minutes a time, to four members of the Environmental Protection Agency. They voiced opinions about a controversial process called hydraulic fracturing, or fracking, to tap into huge reserves of shale gas thousands of feet below ground. New York sits on one of the largest known reserves of natural gas, which many people, including President Obama, have called a new, crucial resource for the country. But residents in places where fracking occurs have raised concerns that the process isn't regulated enough -- that it leaches dangerous chemicals into groundwater and contaminates it with methane gas. Proponents believe that natural gas development can be a huge boon for the area, and drilling needs to happen as soon as possible. Fracking, which is state regulated, isn't legal in New York yet, and there was enough of an uproar about these issues that locals called for the EPA to step in and study the process. People on all sides are clamoring for the study, which is expected to be completed by 2012. 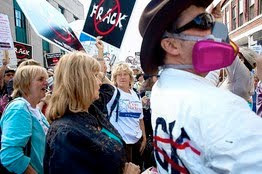 The pro-fracking camp believes that good science will exonerate the practice. Anti-frackers want to know the process is safe before companies start drilling for shale. The EPA is under pressure. After the hearing, Fortune spoke with Fred Hauchman, the Director of Science Policy about the task ahead of him. He offered insight about how to get good scientific results in a short timeframe, the EPA's communication challenge and the benefit of getting face time with the people. Why did the EPA agree to study this? Natural gas is important to the country, but at the same time a lot of concerns have been expressed. And the public deserves to have answers to their questions. How do you design a study that's going to yield answers in just two years? Unquestionably it will take resources and it will take a lot of focus and energy. I don't think any of us have any illusions that we'll have all the answers in two years. But we're convinced that we can do research over this period of time that will be very informative. What's going to be the main focus? We were directed by Congress to focus our efforts on drinking water. But people have said, several times, take a comprehensive look at hydraulic fracturing -- you can't just look at one part of it. We see a challenge there -- obviously, we can only do so much with the resources we have and the time we have. But we need to consider those comments. We have this two-year timeframe, during which we expect to get good results, which we would characterize as preliminary. We know that there are going to continue to be questions. Any researcher will tell you we have to keep studying this. This is a big task we've taken on, and we anticipate that research will have to go on beyond that two-year period. How many people in the EPA will work on this? We've not fully resourced it. Right now we just know it's going to take a sizeable effort. It's been identified as one of the top priorities for our Office of Research and Development. That came right out of the system administrator's mouth. Do you have an idea of the plan of attack? We're going to propose to the Science Advisory Board that some part of the study look at operations before they begin, in addition to testing sites during development and after drilling has started. We're also looking retrospectively because the states have information through their regulatory activities. We're looking at existing data that we have in hand that can help us, but we're also looking at doing studies alongside fracturing operations. People on both sides are so passionate about this. Is drilling for natural gas getting more scrutiny than methods of producing other kinds of fuels? Everybody's looking at this study. I think it's fair to say that this administration has come in and told us from the get go that transparency is the hallmark of everything we do. I think this is a great example of that. It's to our benefit. Venues like this with input from the public are very, very helpful. Do you consider it the EPA's responsibility to keep educating people once the results come out? Sure, we're going to need to go to great lengths to help with the interpretation of what's likely to be a very complex study in the end. There are a lot of technical issues, and unless you're an expert in that area, it's difficult to get your head around it. We're going to need to go the extra mile to translate and respond to questions. You've sat through four four-hour sessions within the past two days. You must be exhausted. Actually it's good. It's important for us to hear real concerns. What a great opportunity for science to really inform some very important decisions. BINGHAMTON, N.Y.—Environmental Protection Agency officials said Monday that they plan to widen their investigation into a natural-gas drilling technique that the energy industry says is critical to tapping huge new supplies of natural gas. A protest in Binghamton, N.Y., against hydraulic fracturing, ahead of an EPA hearing on the water-intensive natural-gas drilling technique. They spoke at a public hearing here that attracted hundreds of people on the controversy over whether the technique—called hydraulic fracturing, or "fracking"—poses a risk to drinking water. The American Petroleum Institute, an energy-industry trade group, says that, with the help of fracturing, the Marcellus Shale formation, which extends from Ohio and West Virginia into southern New York, could produce as much as 18 billion cubic feet of natural gas a day and support as many as 280,000 jobs. 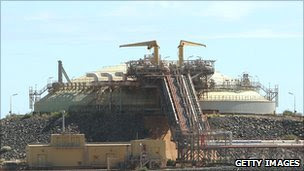 The process involves pumping large amounts of water laden with sand and chemicals deep underground to release natural gas trapped inside rock. EPA officials said at the hearing that they intend to look beyond whether the chemicals used in fracturing pose a threat to water quality and evaluate the impact of the heavy volume of water the process requires. They said they also want to study the way gas wells are constructed and the risks that wells could leak gas or chemicals into underground water. Robert Puls, the EPA's technical lead on the hydraulic-fracturing study, said that with companies drilling as many as 16 wells from a single well pad, "that's 80 million gallons of water. Where is that water coming from? Is it competing with other uses, in particular drinking water?" Congress has ordered the EPA to study the impact of fracturing, but the industry has pressed the agency to keep its focus on whether the process puts drinking water at risk. The industry says natural-gas wells drilled into rock thousands of feet below the surface pose no threat to public health, and that there have been no cases of water contamination linked directly to fracturing. Regulators in some states have reported cases of drinking-water supplies contaminated by gas wells, but it isn't clear fracturing played a part. Environmental groups, meanwhile, are pushing for a broader study that also looks at whether hydraulic fracturing uses too much water, and whether it could damage poorly constructed wells, causing contamination that way. EPA officials' comments Monday suggested they are moving in that direction. In a statement Monday, the API sought to play down the water demands of gas drilling. If all the wells planned for New York state are drilled, they could use as much as 28 million gallons a day, the group said. By comparison, it said, golf courses in the state use more than double the water–or a seasonal average of 58 million gallons a day. Monday's hearing highlighted the divisions the drilling controversy has created in rural communities in southern New York and northeastern Pennsylvania that sit atop Marcellus Shale fields. Many landowners and small farmers say gas drilling would be an economic lifeline. Opponents say it could imperil the watershed that supplies drinking water for millions of people along the East Coast. "There's a big difference between a 100,000-gallon hydrofracturing and a three-million to five-million gallon hydrofrack," said Neil Woodworth, executive director of the Adirondack Mountain Club. He warned that the Northeast probably lacks the capacity to clean up the chemical-laden hydrofracturing fluids. "Water in New York State is the most precious resource we have and we can't afford to contaminate it," he said. But the industry's promise of jobs—and big payments for gas leases—appeal to many people in southern New York, where jobs are in short supply. "Rich people do not want gas drilling or any economic development in their backyard," said Douglas Lee, a resident who spoke at the hearing. "They have no concern about how our people make a living. Our communities are poor. We have a high unemployment. Our young people are forced to move away to find work." —Ben Casselman contributed to this article. 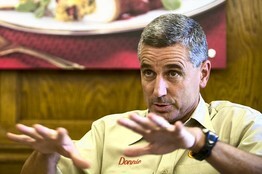 Since being named Tyson Foods Inc.'s chief executive in November, Donnie Smith has helped steer the biggest U.S. meat company out of one of its worst periods ever. Now that profits have replaced record quarterly losses, the hard part looms. Meatpackers have a history of spoiling good times by increasing production too aggressively in a dash for market share, which pushes their livestock costs higher and helps keep them hostage to the boom-and-bust commodity price cycle. Federal antitrust regulators are airing concerns about whether big agribusiness companies have too much power over farmers. Tyson, which annually slaughters two billion chickens, 20 million pigs and seven million cattle, sells meat to some of the world's biggest fast-food chains and supermarkets. Mr. Smith thinks the U.S. economy will remain flat for a while, but is optimistic that the Springdale, Ark., company has gotten its costs down enough to gain customers. He worries that the recession has fomented a "big is bad" feeling about companies. The lanky 50-year-old works in the shadow of one of the most powerful families in food. The family of Don Tyson, the 80-year-old mogul who helped bring industrial scale to chicken farming, controls about 70% of Tyson's voting shares, and his son, John, is chairman. Mr. Smith, who teaches a Sunday school class, says one of his most important jobs as CEO is to promote an ethical culture. The company employs 120 chaplains and he blogs about integrity. From his egg-shaped office, Mr. Smith shared his views on leading his flock. WSJ: How long will the economy be flat? Mr. Smith: I don't necessarily think we are headed to a double-dip recession. But I don't think it is going to be a quick pull out of the hole, either. If we are going to gain share in this market, we need a good cost structure. WSJ: How are you lowering the cost of chicken? Mr. Smith: We were very uncompetitive in our yield of breast meat. The primary reason is that several years ago we made a move towards more mechanical deboning. Now we have made a move back to hand deboning, and we've seen a tremendous yield improvement... which drives out cost. WSJ: Has government support for the corn-to-ethanol fuel industry affected your business? Mr. Smith: Prior to 2006, before ethanol became the user of one third of the corn crop, the cost of producing a pound of chicken was in the mid-20 [cents] range. Today, it is mid-30s. WSJ: What do you want to see done with the ethanol industry? Mr. Smith: Let industries compete without tax incentives. WSJ: What's your management style? Mr. Smith: I've got this little saying: the answer is always in the room. We have to free people up to operate in an environment where there is no fear. We are going to make mistakes. Don't worry about it. Let's fail fast and fail forward. Then take that empowering spirit, and let's go solve some problems. WSJ: On your internal company blog, you mention the Bible as a favorite book. Does your faith affect the way you manage? Mr. Smith: I don't think you can say, "I do all my church stuff on Sunday between nine and noon, and the rest of the time I am either out for myself or running my business." My faith influences how I think, what I do, what I say. There are a lot of great biblical principles that are fundamental to operating a good business. Being fair and telling the truth are biblical principles. WSJ: How moral can a company be? Mr. Smith: We are going to do what is right. And we're going to do what is right for one reason: because it is right. Now listen, we've got 117,000 people. There might be somebody that steps out of line occasionally. We will correct that. WSJ: The Bible says the chances of a rich man getting into Heaven aren't good. Can a Fortune 500 CEO get into Heaven? Mr. Smith: This one will, because I did what the Bible said I had to do to get into heaven. Feeding people is a laudable purpose in life. WSJ: The recession has brought widespread complaints of Wall Street greed. What do you think? Mr. Smith: There seems to be this attitude that big is bad. And it really does bother me. Big banks are bad. Big Ag is bad. And you know what? We're not bad. We provide jobs for 117,000 people around the world. We make great, safe food products. WSJ: Last thing: Which of your beef customers makes the best hamburger? Mr. Smith: There is zero chance I am answering that question. No, I will tell you who makes the best hamburger: I do. WSJ: So it's not McDonald's? Burger King? Wendy's? Mr. Smith: On my grill. WASHINGTON — The Environmental Protection Agency asked nine natural gas companies Thursday to voluntarily disclose the chemical components used in a drilling technique called hydraulic fracturing. The agency said the information is important to its study of the controversial drilling practice, also known as "fracking." Crews inject vast quantities of water, sand and chemicals underground to force open channels in sand and rock formations so oil and natural gas will flow. The EPA is studying whether the practice affects drinking water and the public health. Drilling companies have largely sought to protect their chemical formulas, calling them proprietary. Environmentalists are concerned that the chemicals, some of them carcinogens, will taint underground water supplies. The EPA is taking a new look at fracking as gas drillers swarm to the lucrative Marcellus Shale region in the northeastern United States and blast into other shale formations around the country. Fracking is exempt from federal regulation. The process is touted as the key to unlocking huge reserves of clean-burning natural gas. Supporters say the practice is safe, noting that it is done thousands of feet below ground, much deeper than most water sources. They also point out that authorities have yet to link fracking to contaminated drinking water. The EPA said in March it will study potential human health and water quality threats from fracking. "By sharing information about the chemicals and methods they are using, these companies will help us make a thorough and efficient review of hydraulic fracturing and determine the best path forward," said EPA Administrator Lisa Jackson. "Natural gas is an important part of our nation's energy future, and it's critical that the extraction of this valuable natural resource does not come at the expense of safe water and healthy communities." Letters were sent to nine leading national and regional hydraulic fracturing service providers, including Halliburton, Schlumberger and Key Energy Services. Chris Tucker, a spokesman for Energy In Depth, a Washington-based group that advocates for the energy industry, said the EPA study offers an important opportunity to demonstrate that fracturing technology is safe, efficient and well-regulated by the states. "If EPA believes it needs specific information to ensure its study draws on the best science and data available, we're hopeful the agency can coordinate with our members to ensure it has everything it needs, and uses that information in an appropriate way," Tucker said. The EPA requested the information within 30 days and asked the companies to respond within seven days whether they will provide all of the information. If not, EPA said it is prepared to use its legal authority to force the companies to provide the information. In Pennsylvania, where the Marcellus Shale is being pursued in a modern-day gas rush, state legislators and environmental regulators are pushing for a law to require drilling companies to disclose what's used at the well sites. "We have broad right to know about the use of chemicals and discharges of any sort into the environment," said John Hanger, Pennsylvania's environmental protection secretary. Shale Gas- Fracking debate heats up - Another BioLargo Technology Opportunity for Nature's Best Solution(TM) Goes Front and Center! NEW YORK (CNNMoney.com) -- Hundreds of people are expected to pack an upstate New York auditorium Monday as the federal government enters the fray over a controversial technique for natural gas production. The hearing is the public comment portion of an ongoing Environmental Protection Agency investigation into whether or not hydraulic fracturing, a process that injects thousands of gallons of chemical-laced water and sand into natural gas wells, cracking the shale rock and allowing the gas to flow out, is safe. Residents in rural Pennsylvania fear expanded drilling for natural gas carries a sinister side. Fracturing - or 'fracking' - has helped usher in one of the biggest energy booms in U.S. history. It's also generated fear over ground water contamination and other hazards. "It's a trap," said Martha Robertson, a resident of Dryden, N.Y., who is traveling to the hearing in Binghamton on Monday. "If it comes to New York it will transform our landscape, our economy, and our way of life. I'm deeply concerned about going in this direction." The hearing will be the fourth the EPA has conducted across the nation as it attempts figure out if fracking, which is expanding on a rapid scale in shale gas fields across the country, is safe. Monday's meeting, where opposition to fracking runs the highest, was originally set for last month but was changed at the last minute. Security had to be reassessed because thousands of people were expected to show up. Now, about 2,000 are expected, said Binghamton Deputy Mayor Andrew Block, who said people only had a couple of weeks to plan for this meeting. Nonetheless, the city will close off two roads around the auditorium on Monday, keep about a dozen police on hand, and set up designated areas for both pro and anti-drilling advocates to gather. "People are expecting tension," said Robertson. "This is as tense issue." A second day of hearings is set for Wednesday. People in New York sit atop the Marcellus Shale, one of the largest natural gas deposits in the nation which extends beneath Pennsylvania, West Virginia and Ohio. But shale gas development is happening nationwide. Thanks to higher prices and new technology, vast reserves of natural gas are now available. Over half the states have shale gas reserves. Large deposits are also found close to major cities like Denver, Dallas, Chicago, Detroit, Philadelphia and New York City. The size of this resource is massive, effectively doubling the nation's gas reserves, according to a recent study from Massachusetts Institute of Technology. Investment money is pouring into the sector. Exxon Mobil (XOM, Fortune 500) recently paid over $40 billion for a shale gas company, a sign that the industry has hit the big time. Shale gas production, virtually nonexistent ten years ago, now accounts for about a fifth of the country's gas consumption, according to the MIT study. It's on track to provide over half the nation's gas by 2030. "It's a game changer," said Melanie Kenderdine, executive director at MIT's program. "It's significant supply at relatively low cost. An enormous opportunity." That's good news to people concerned about global warming or foreign oil dependence. Most natural gas is burned to produce electricity or heat and cool buildings. When burned, it emits about half the carbon dioxide as coal, and most of the country's big environmental groups are cautiously supportive of increased development. Natural gas can also be used to power modified vehicles. Although not yet popular for cars, the idea is catching on among operators of large fleets: city busses, delivery trucks adn the like. If adopted more widely, cleaner burning cheaper gas, could put a big dent in the nation's oil imports. But extracting shale gas comes with a dark side. Producing the gas involves drilling deep underground and injecting massive amounts of chemical-laced water and sand to free the gas from a seam of shale rock. People living near the drilling are afraid the process will contaminate their drinking water, and there have been several cases where the water supplies have been ruined. They are also shocked at the pace of development this industry is undergoing. Trucks and drilling rigs operating round the clock, roads widened, pipes laid. Fracking has been around for decades, but has never been done on such a massive scale and so close to major population centers. The industry says the water contamination is the result of isolated accidents unrelated to fracking. They point out that thousands of wells are drilled each year, and there have only been a handful of problems. They say the fracturing occurs thousands of feet below the water table, far from the drinking water. When the wells do pass through the water table, the industry goes to great lengths to protect the water by lining the wells with concrete and steel. "We've drilled over a million wells in the last 60 years," said Daniel Whitten, a spokesman for the American Natural Gas Alliance. "We think the process is safe." Up until now, the government has generally agreed with the industry and has left regulating the process largely up to the states. But the 2005 energy act did not subject fracking to the Clean Water Act, which largely sidelined the agency. Responding to public pressure, Obama has ordered EPA to study the issue again, although results from the investigation aren't expected until late 2012. Many people that live near shale sites want the drilling stopped until the EPA study is complete. On Thursday, the EPA asked companies to disclose what chemicals they are injecting into the ground. Many people want more, including greater EPA oversight, more enforcement personnel, and greater treatment of the fluids when they are returned to the surface. Dear French Camp, Calif. residents: help is on the way. 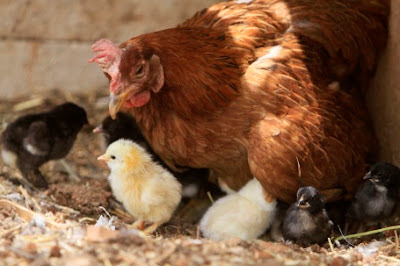 Beyond the recent salmonella slide plaguing egg farms across the country, Golden-State neighbors of the Olivera Egg Ranch have dealt with a more textbook issue: breathing in unpleasant ammonia-like odors from the farm's waste products. Now, the farm is turning to its 1 million pounds of weekly waste to eradicate the ecocentric problem. The Stockton Record reports that Olivera plans to pair up an anaerobic digester with a 1.4-megawatt fuel cell to power its daily needs. While local critics express doubt about the changes, one of the purported benefits of the digester is its ability to rely on methane gas from the poultry waste. That minimizes the nitrogen/sulfur oxides dampening the local community's air. Similar chicken-waste controversies are in full force on the opposite coast. The Baltimore Sun writes that environmental organizations are embroiled in a battle with poultry producers over the companies' responsibility to monitor individual farmers' pollution. The groups argue that lack of proper oversight is threatening natural bodies of water like the Chesapeake Bay. Large conglomerates like Perdue say its not their problem, contending those types of stringent measures will have economic repercussions for chicken consumers. Let's Hear it for the Grooms! 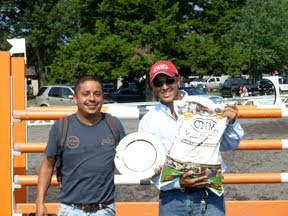 Odor-No-More proudly recognized the back bone of the barn when they presented the Groom's Award during the Winston National and the Constitution Classic. At the Winston National the Groom's Award was presented to Mikey Rodriguez who grooms for High-Performance rider David Jennings, while Dominique Holt of Cut to the Chase Farm, under trainer Jess Fortin, earned the title during the Constitution Classic. The winning grooms received an engraved trophy and samples of Odor-No-More to use at home and on the road. "Dominique [Holt] does a fantastic job at helping with the day-to-day operations here when the barn has several horses a day showing," said Fortin. "It's great to see her efforts being rewarded, all the grooms deserve to be honored. We would truly be lost without them!" 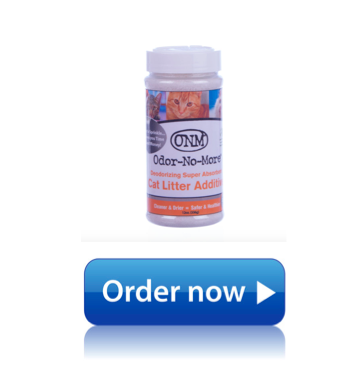 Odor-No-More Products are eco-friendly solutions which provide animal owners the ability to save time and money maintaining their animal's enclosures. 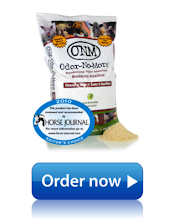 The products consist of a proprietary blend of micro-nutrient salts that are commonly found in animal feed supplements and hoof care products, to safely eliminate odors and wetness. For more information on Odor-No-More, please visit www.odornomore.com.